If you’re like most dividend investors, you’re probably keeping a nervous eye on bond yields right now. And, well, you should be—but only if you own low-yielding (or slow-growing) Dividend Aristocrats like, say, PepsiCo (PEP). But if you buy (or already own) the 5 “undercover” high yielders I’ll show you at the end of this article, I have great news for you. You can ignore inflation, bond yields and the Fed and simply keep on collecting your fat dividend checks. In fact, this overdone selloff has given us an open window to buy more! Before we get to that, back to PepsiCo. As you probably know, the yield on the 10-year Treasury note has spiked from 2.3% in early December to more than 2.9% today. And guess what PEP’s dividend yield is? 2.9%. So in a matter of a couple weeks, the 26% gap between the two yields has shrunk to zero. The question then becomes: with that gap narrowing, why would you buy PEP, a company whose biggest business, North American beverages, is on the wrong side of the landslide toward healthier drinks? Because even though PEP beat expectations in the fourth quarter and delivered a 15% dividend hike, in the background are flat year-over-year revenues, no thanks to a 6% drop in North American drink sales. No wonder CFO Hugh Johnston said PEP has “challenges” in its business. We don’t envy him, with more than a third of his sales tied to popular drinks of yesteryear! The problem with PepsiCo and its ilk is that their sales are stalling out at precisely the wrong time: just as bond yields rise. That means their dividends, which depend on rising sales and earnings to go higher, will get left in the dust. Result: income-hungry first-level investors will dump these paupers in droves, practically guaranteeing they’ll underperform. 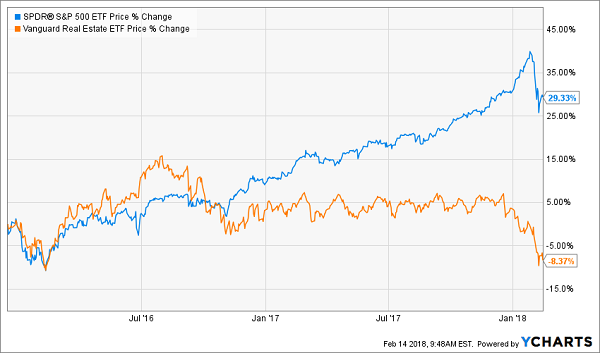 “Safe” Stocks Are Anything But! Funny thing is, history is repeating itself. What happened? None of these household names could squeak past the S&P 500. But don’t worry, because there is one sector that crushed the market then and is woefully undervalued now: real estate investment trusts. And when I say “crushed,” I mean it. First-level investors would take this as a sign that now is the time to sell REITs and look for safer income plays. But the right move is the exact opposite. Unlike consumer staples stocks, REITs boast fat dividend yields: VNQ pays 4.7% now, and many REITs, like 3 of the 5 I’ll reveal below, yield 6% and up. Let’s be honest: the 10-year will never rival payouts like those! The best REITs—including all 5 below—are seeing rising sales (which PepsiCo’s Johnston can only dream of! ), driving payout growth that will keep the yield on your original buy rising for years. As I wrote on January 23, a surging payout is the No. 1 driver of share prices. The bottom line? 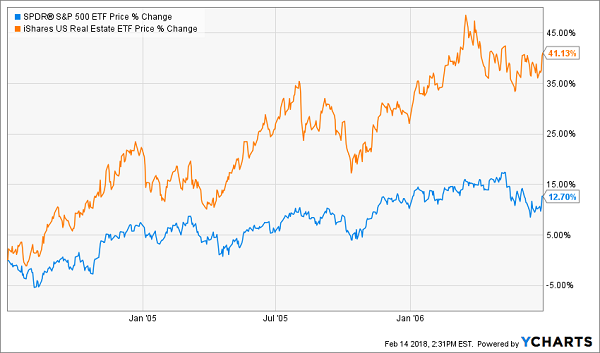 Now is the time to buy REITs! So let’s dive into the 5 I have for you. They either boast a sky-high yield, surging dividend growth … or both. They are: Easterly Government Properties (DEA), Physicians Realty Trust (DOC), Life Storage (LSI)—a REIT I named as a “buy-and-hold-forever” stock in November—Preferred Apartment Communities (APTS) and STAG Industrial (STAG). 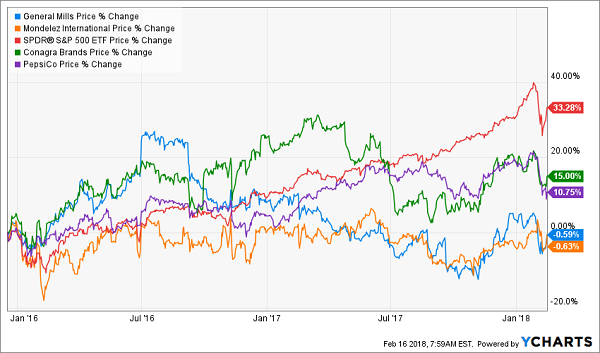 You can see that our 5-REIT mini-portfolio represents a range of REIT sectors, with one glaring omission: shopping-mall REITs, whose tenants are being eaten alive by Amazon.com (AMZN). You’ll also see that all 5 either have tenants who aren’t going anywhere, like Easterly (its buildings were 100% occupied at the end of Q3) and Physicians Realty (when was the last time you heard of doctors being tight for work?) or are benefiting from something the first-level crowd always forgets when rates rise—a surging economy! You can see below that all 5 boast either a high yield, soaring payout growth (getting you a high yield on your initial buy in short order) or both. And they’re backed by safe payout ratios (90% of FFO paid as dividends is a sustainable number for well-run REITs). 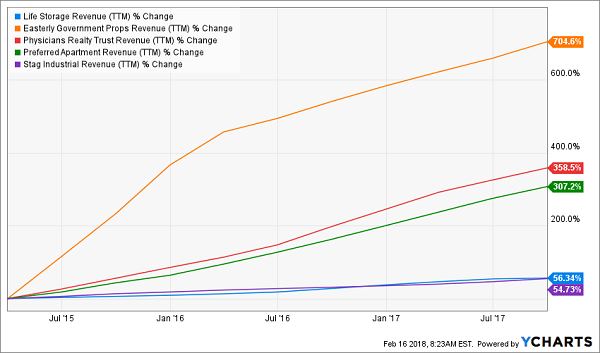 So you’re already getting a nice 5.9% average dividend here—3 times more than the average S&P 500 stock pays—and generous payout growth, too. Finally, valuation. Thanks to the selloff, DEA trades at 16.8 times trailing-twelve-month FFO; DOC clocks in at 14.3; LSI, 15.2; APTS at just 9.9; and STAG at 13.8. These are bargain numbers for cash-spinning businesses like these. And they won’t last once the herd realizes that CDs and Treasuries still won’t be enough to retire on. 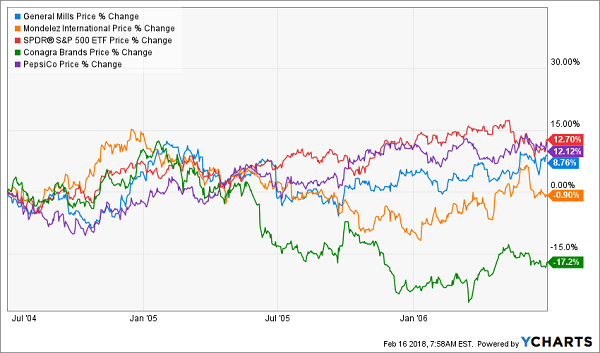 I’ve just pulled the wraps off my new 8% “Monthly Dividend” portfolio, and I’ll show it to you now—FREE—when you click right here. Dividends paid monthly, so you don’t have to struggle to manage a cash flow that comes in quarterly while your bills come in every month!PLUS if you’re not leaning on your portfolio for income, you can parlay these gaudy 8% payouts back into these “elite 8” stocks even faster, growing your nest egg and your dividend stream in the process. It really is a set-it-and-forget-it wealth-building machine! Buy the 8 bargain monthly dividend payers I’ll show you here. The result? $3,333 in income every month on a $500,000 nest egg, with upside on your initial $500,000 to boot! And this strategy isn’t capped at $500,000. If you’ve saved a million (or even two), you can just buy more of my 8 monthly payers and boost your passive income to $6,666 or even $13,332 per month.